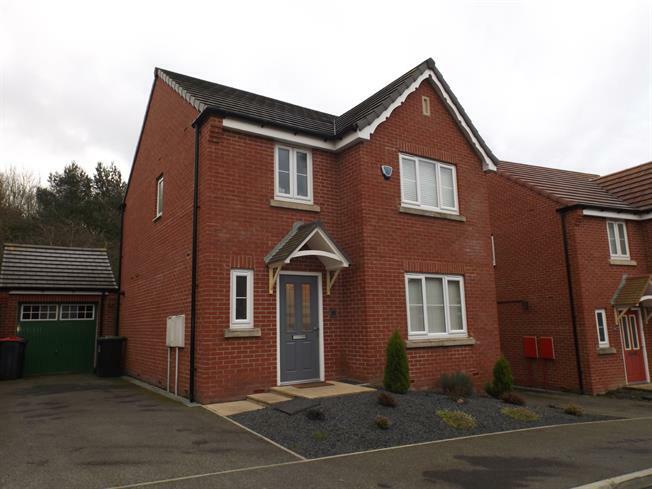 3 Bedroom Detached House For Sale in Sutton-in-Ashfield for Asking Price £184,950. As good as new three bedroom detached family home with driveway for two cars, garage and enclosed rear garden. Ideally situated for A38 and M1 commuting. Internally there is an entrance hallway, downstairs WC, stunning kitchen diner with French doors to the garden and integrated appliances, and a lounge. Upstairs there are three bedrooms, an en-suite to the master and main family bathroom. Double glazed door. Single radiator, vinyl flooring, built-in storage cupboard. Double glazed uPVC window with frosted glass. Single radiator, vinyl flooring, part tiled walls, spotlights. Low flush WC, pedestal sink, extractor fan. UPVC French double glazed door. Double glazed uPVC window. Double radiator, vinyl flooring, under stair storage, boiler, spotlights. Square edge work surface, wall and base units, stainless steel one and a half bowl sink with mixer tap and drainer, electric oven, microwave, gas hob, overhead extractor, integrated standard dishwasher, integrated washing machine, integrated fridge/freezer. Loft access. Single radiator, built-in storage cupboard. Double glazed uPVC window. Single radiator, sliding door wardrobe. Double glazed uPVC window with frosted glass. Heated towel rail, vinyl flooring, part tiled walls, spotlights. Low flush WC, double enclosure shower, pedestal sink, extractor fan. Double glazed uPVC window with obscure glass. Heated towel rail, vinyl flooring, part tiled walls, spotlights. Low flush WC, panelled bath with mixer tap, shower attachment over bath, pedestal sink with mixer tap, extractor fan.